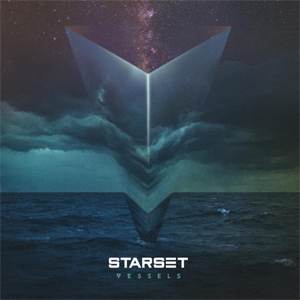 Coinciding with the release of their sophomore album Vessels, cinematic rock band STARSET will launch a U.S. headlining tour on January 14 in Flint, Michigan, with a hometown record release show in Columbus, Ohio set for January 20. Direct support on the tour is GEMINI SYNDROME. Tickets go on sale starting Friday, December 9. The four-week outing will take front man Dustin Bates and his helmeted-and-pressure-suited crew, bassist Ron DeChant, guitarist Brock Richards and drummer Adam Gilbert, across the country, stopping in such cities as Chicago, Denver, Spokane, Reno, Scottsdale, Dallas, Houston, Little Rock, Baltimore and Pittsburgh with a Los Angeles show at The Roxy confirmed for January 31. See below for full tour routing. "We look forward to the freedom that headlining will bring - allowing us to further realize our sonic and visual objectives. This will be the most immersive series of 'demonstrations' to date," says Bates. Vessels--set for release January 20, 2017 via Razor & Tie--is a data-stream rendered in sound where Bates becomes the deus-ex-machina in an age of information overload that is increasingly complex yet ultimately human. From atmospheric opener, "Back To The Earth" to the driving hooks of the album's first single, "Monster" to the catchy, nearly progressive moments of "Frequency", Bates has succeeded in escaping the gravity of formula radio rock. Instead, he has re-imagined his genre-defying vision as an arena where Hans Zimmer interfaces with RADIOHEAD and Trent Reznor. Vessels was produced by Rob Graves (HALESTORM, RED) and mixed by Ben Grosse (BREAKING BENJAMIN, FILTER), who also helmed their 2014 Razor & Tie debut, Transmissions, a landmark album selling in excess of a quarter million combined albums, streams and downloads, and propelled by singles including the unforgettable "My Demons" (which spent an unprecedented 43 weeks scaling rock charts). Watch the official audio video for "Monster" below, which has already amassed over 1.4 million views since its October 28 release. With over 300 shows logged to date, STARSET has distinguished themselves touring with the likes of BREAKING BENJAMIN and IN THIS MOMENT, playing major U.S. rock festivals and four sold out performances in planetariums, becoming the first rock band to play live in the full dome entertainment environment. This spring, the band will return to Welcome To Rockville, Fort Rock, Carolina Rebellion and Rock On the Range, the famed rock festival in the band's hometown of Columbus, OH, following their 2015 debut at all four events.